My name is Dan Tanno. I am an interpreter, as well as the representative of an interpreting agency called IRIS. "IRIS " stands for IR Interpreting Services of Japan. We are a boutique agency with 8 interpreters, focused on IR interpreting. about IRIS, and how we are trying to change the world of interpreting. I started my career in interpreting as a freelance interpreter. I registered with several agencies, had work introduced from them, and got paid by them. While I was grateful for having jobs introduced to me, I also felt like a sub-contractor （下請け). I guessed the agencies' margins were quite high. I say "guessed", because I didn't know. I didn't know how much margins the agencies were charging, because I wasn't told how much the client was paying for my interpreting services. D "How much did the client pay for that job I did the other day?" The agent told me that it was a secret, and that they couldn't tell me. I was embarrassed for not knowing the rules of the trade （業界のしきたり）. I was not allowed to contact the clients. "Please hand in all the meishi you collected today." That was to prevent me from contacting the client. Together with the fact that I didn't have much work to do, mainly because I was still a 駆け出しの通訳者, these little things led me to feel that I, as a freelance interpreter, was in a somewhat weak and vulnerable position. I felt that the power balance between the agent and myself was unbalanced, and that the agent was much more powerful than me. I thought this was a problem. Not a big, serious problem, but nonetheless a problem. Talking to my fellow freelance interpreters, I felt that they too shared my view. Maybe not in the exact same way, but they too felt some kind of frustration against the interpreting agencies, against the system. A problem existed. I had no idea how I was going to solve it, but I told myself to make a note of this in my mind, and never forget how I felt as a freelance interpreter. Someday, I was going to find great partners and solve this problem together. After several months as a freelance interpreter, I joined Nomura Securities as an in-house IR interpreter. I started working on IR meetings, between overseas investors and Japanese companies. And then one day, something wonderful happened. Something that would change my views about interpreting, and create the core of IRIS. "My client says he wants to work with you when he comes to Japan next month." I had worked with that client since joining Nomura, and I guess he liked me. I don't know if he liked my interpreting, my personality, my amazingly great looks, my whatever. I didn't matter. The important thing was that the investor liked me, and that he chose （指名） to work with me. This changed the way people in the firm regarded me. And, more importantly, it changed the way I looked at myself. Instead of feeling like a weak, vulnerable sub-contractor, I felt like a proud, powerful professional (PPP（笑）). I felt less like a commodity, but more like someone that adds value. I was not working under an agency any more, but if I had been, my position against the agency would have improved a little. One by one, investors, as well as Japanese companies, started to choose to work with me. When I am chosen by my client, I feel motivated. I feel grateful for having been chosen, and I want to prove myself and make the investor happy （恩に報いたい）. That leads to my performance actually improving! I knew that some interpreters/translators were fortunate enough to enjoy this cycle. I also knew that many weren't. I wanted all interpreters and translators in the world to enjoy this cycle. So, I decided to make this concept, of being chosen （指名される） by the client, the core of IRIS. I felt that this might be the one and only breakthrough （突破口） to improving the interpreting industry. I'll explain why later. We set up IRIS this February. We try to ensure the quality of our interpreters by having a very rigorous selection process, with multiple entrance tests. We conduct IR Interpreting Workshops. We share a Database of all the companies we have visited so far. We work as a great team, and share information with each other on a daily basis. A good example is when 2-3 interpreters work on a 5-day visit by an investor. "These are the things she asks." We treat our interpreters as "customers", not sub-contractors. We keep telling them that the money the client is paying is not IRIS's, but yours (the interpreters'). (The client is paying the "interpreting fee", not the "agency fee". The red arrow shows the conceptual flow of money at IRIS. 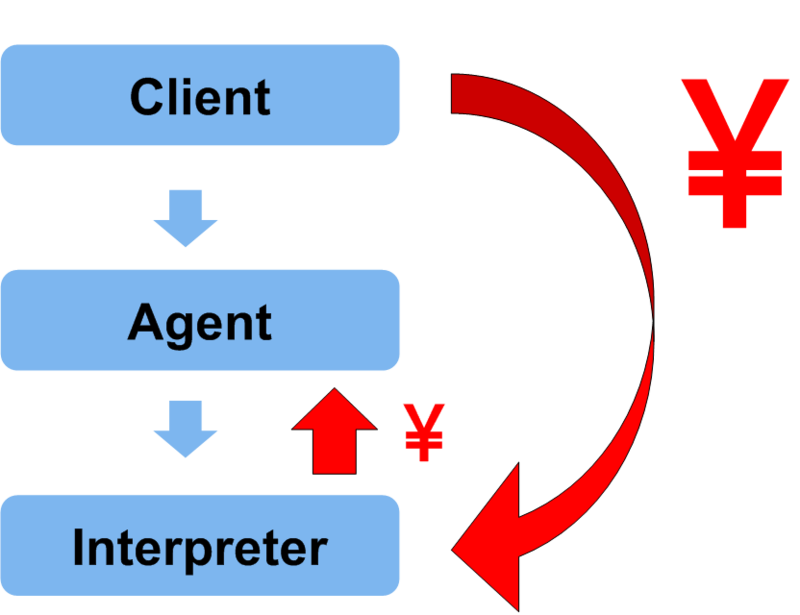 You can see that it is not the agent (IRIS) that is paying the interpreter, but that the interpreter is paying IRIS. Therefore, the interpreter is not a sub-contractor, but is the customer. We ask the interpreters to choose how much fees they want to pay IRIS. When it comes to the disclosure of information to our interpreters, we have a very strict confidentiality policy. We hide nothing from our interpreters, including how much the client is paying us. We do not prohibit our interpreters from contacting the investors (our clients). In fact, we encourage it. I think this is a natural thing to do. After all, the interpreters are IRIS's top salesmen. It's illogical to prevent your sales people from becoming friends with your clients. All these efforts, both in terms of quality and motivation, are to help our interpreters be chosen （指名される） by the investors. We try to empower the interpreters, by helping them further improve their performance, and also motivating them to be even better. "If you are an agent, why are you trying to empower your interpreters?" I have 2 answers to that. 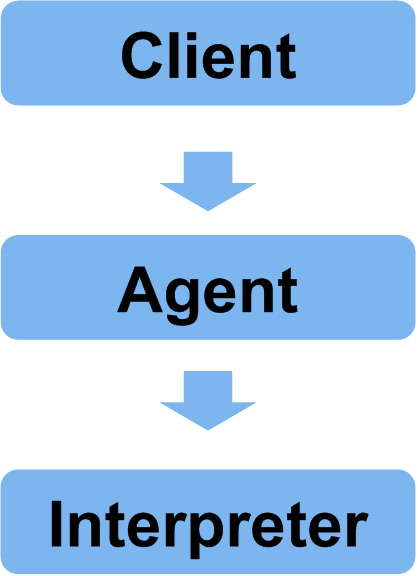 If you look at the relation between the agent and an interpreter as a zero-sum game, you're right. The more powerful the interpreter gets, the lower my margins become. Instead of thinking about it that way, we try to focus on expanding the gross amount of our revenues, meaning the amount we charge clients. If we can prove to the client that we excel in our performance, and that good interpreting is crucial to the success of a meeting, we should (eventually...) be able to charge a premium for that. Of course, some clients will always be focused just on price. For these clients, we can offer the lower priced interpreters. But if you want to work with the best, please pay a small premium. This is the message we have to get through to our clients. The only way for IRIS to succeed is to empower the interpreters, and help them be chosen by the clients. Everything we do at IRIS should be with the aim of providing value to our interpreters. That's all we should focus on. Our interpreters. IRIS wants to become an agent that will be "chosen" by the interpreters. However, under the current structure of the industry, there's no point in trying to please the interpreters. That's because, it's not the interpreters that choose the agency they want to use. 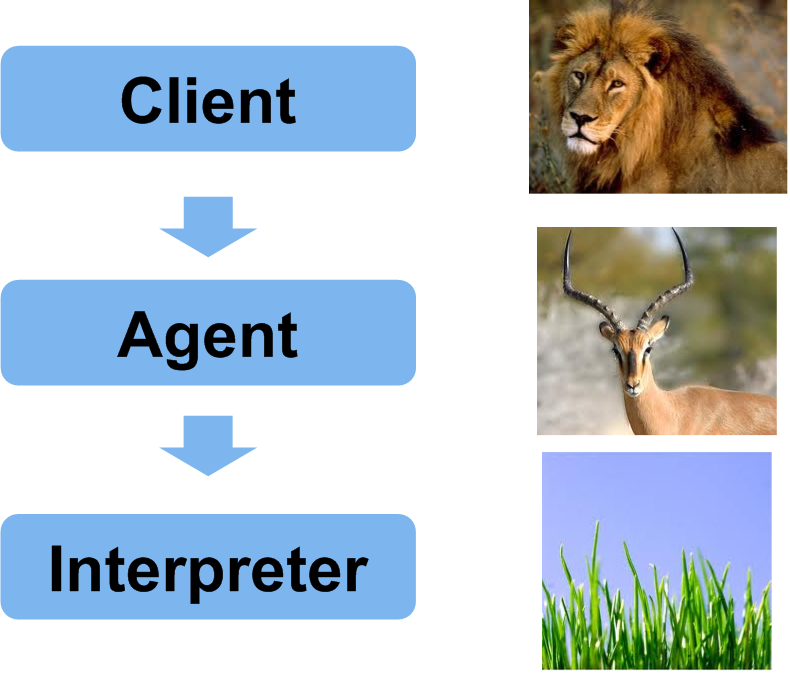 Currently, it's the agency that chooses the interpreter they want to use. Unless we make the interpreters choose the agency, there is very very very little incentive for the agencies to become better for the interpreters so that they will be chosen by the interpreters. 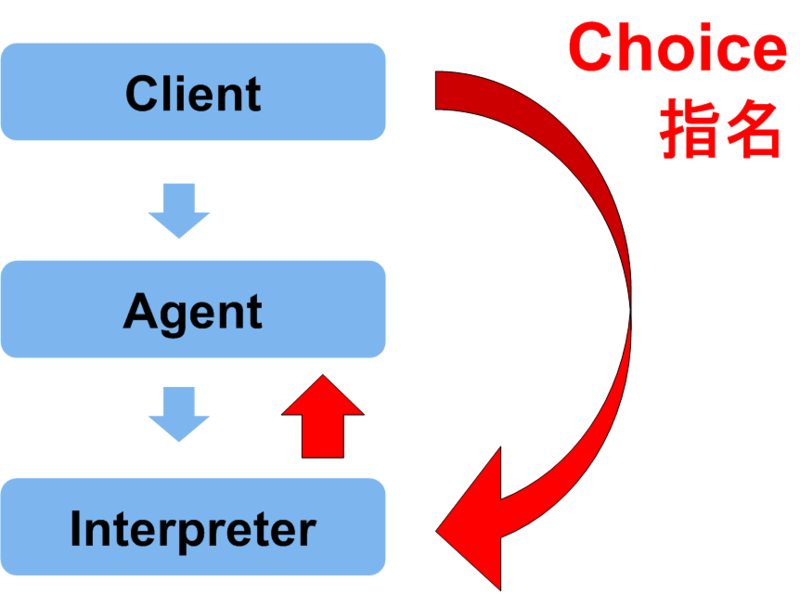 At the moment, agencies are only looking in the direction of the clients, because it's the clients that chooses the agent, not the interpreter. Agents also wrongly think that it's the client that's paying them, when in fact, it's the interpreter that is paying the agent. Once we get the clients to choose the interpreter they want to work with, there will come a day that interpreters will gain the initiative, and it will be the interpreters choosing the agents. THAT's when the real competition among agents will start. The race to provide value to the interpreters, not just to the clients. THAT's the race that IRIS wants to be in, and win. Today, various types of people are gathered here. 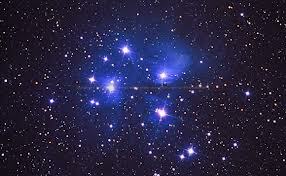 Interpreters and translators, I think you are the stars of the industry. Your role is to inspire your clients through your performance. Agents like myself are here to help you stars shine. Our role is to bring out the best in you, and get clients to choose you. As agents, we are here to help you monetize your excellence. IRIS is not just an agent, we are your agent. We have different roles, positions and ideas. But we all share a common goal, which is to make the interpreting/translation world an even better place than it is today.